(Al Hartmann | The Salt Lake Tribune) Juan Arce-Larreta, chair of Parleys Rails Trails and Tunnels Coalition, takes the first official ride to open a long section of Parleys Trail at Tanner Park Tuesday Oct. 17. Rosecrest Elementary fourth graders greet him with a wall of high fives. Made possible by the 2012 Parks and Trails bond initiative, completion of these phases means eight miles of the trail is now complete from the Bonneville Shoreline to 900 West. 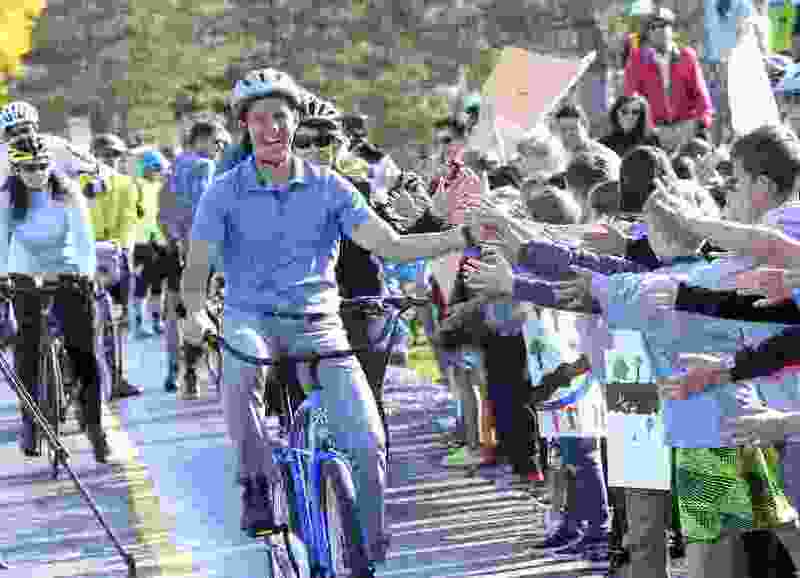 With a snip of scissors, Salt Lake valley government leaders officially opened two new sections of the Parleys Trail for bikers, walkers and other recreation uses on Tuesday. The completed segments now connect 8 miles of recreation space between the Bonneville Shoreline Trail in Millcreek City and 900 West in Salt Lake City. The 1.5 mile eastern segment connects the shoreline trail with Sugar House Park and features two bridges and a tunnel. The western segment connects 300 West with 900 West, crossing under interstates 15 and 80, and over the rail switching yards and Utah Transit Authority TRAX lines in South Salt Lake. The complexity of building trails through developed urban landscape makes their completion a “major engineering feat,” county parks and recreation spokesman Clayton Scrivner said. The eastern section was paid for through a $7 million parks and trails bond passed in 2012 . The western segment cost roughly $1 million, Scrivner said. A third trail segment, which will connect 900 West to the Jordan River Parkway, is in development.